After reading Sky's introductory post for this past month's book club read, I was ready to dive on into King Solomon's Mines . However, I took my own sweet time getting around to it, completing it just yesterday. If Sky piqued my interest in it, C.S. Lewis solidified it. 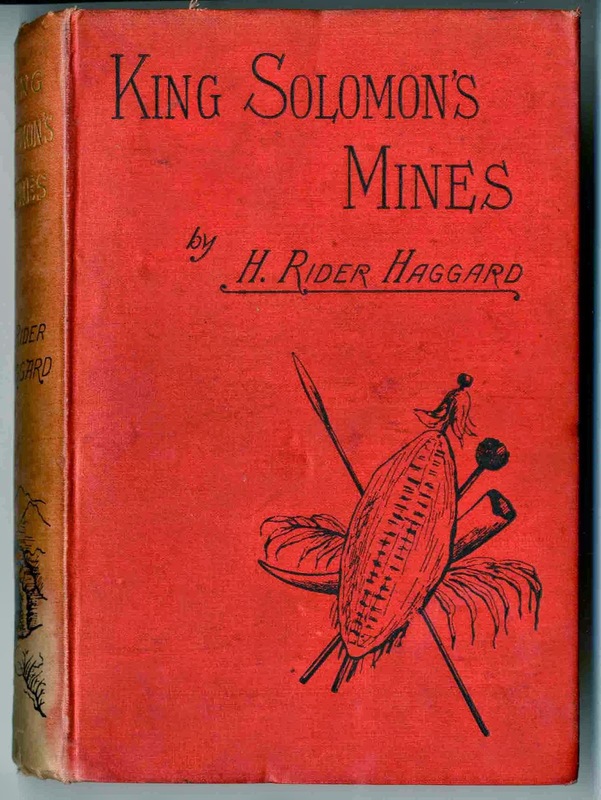 Before reading King Solomon's Mines I was reading Live Like A Narnian and in the back of the book, author Joe Rigney noted that Haggard's book was one of Lewis' favorite as a child. Lewis wrote both about the book and the movie version of it in his essay On Stories (available for free online) and I'll share what he said about it in just a minute. I tried not to pay attention to Lewis' thoughts until I had read the book for myself. First, let's discuss the story itself. In this book we follow along with three men - Allan Quatermain, Sir Henry Curtis, and Captain Good - as they seek treasure in Solomon's "lost" mines and also the missing brother of Sir Henry. They traverse the desert in Africa with the help of a few good (tribes)men and have quite a few spectacular adventures finding what they are looking for. This story was first published in 1895 and was well-received by the public. Billboards and advertisements around London called it, "The Most Amazing Book Ever Written!" (Almost makes authors and potential authors a bit green with envy, doesn't it?) It is notable for being the first African adventure published in the English language and it is credited with creating a new category of book: the "lost world" genre. (Kipling's The Man Who Would Be King also falling into this genre.) Not bad for a book that was written as a result of a five shilling wager against his brother who bet that Haggard couldn't write a book half as good as Treasure Island, eh?! Publishers had trouble keeping up with the public demand for more copies. I think that's a sound win. 1. He made some of the Africans people of distinction and addressed them as "gentleman." He made them intelligent and not - as was common for the time - barbaric. He elevated their status, giving some of them prime roles into the story which was then unusual. 2. Also of interest, he created a biracial romantic relationship between a white man and a black woman. This had never been done before and is worthy of note. This to say that King Solomon's Mines expresses much less racism than other books of the day and even "broke the mold" to some degree. I'll probably see the movie anyway. But I don't think I'm going to like the ending very much. I am very glad that Sky chose this book for us to read last month. It's definitely a tale that will stick with me and I look forward to passing it along to my own kids when they are some bit older. For a moment in time, the pleasure of this book is mine and I'm happy. If you didn't get around to reading it this past month, put it on your reading list and find some time for it in the future. It's a pretty engaging read. I read the first chapter, was intrigued, but got pulled away. I checked out too many books from the library and had a bunch of holds come available at the same time. All adoption or parenting books, so I've been up to my eyeballs in nonfiction lately. Hopefully I'll get to read Narnia this month! And I do plan on reading King Solomon's Mines at some point! At the beginning of the month I read several descriptions of it but none sounded appealing. I did get the free Kindle version, though, so maybe I'll give it a try some time. What you said about how he talked about Africans was spot on. I wasn't ever offended by what he called them - it was more just factual description and never came across as derogatory. Oh dear, you're making me wonder if I should pick it back up! I got 30% into it, and just couldn't make myself finish it. My reading time has been severely limited lately, and it just didn't seem worth the stolen minutes here and there.